Kim Shin-wook (Hangul: 김신욱; Korean pronunciation: [kim.ɕi.nuk̚]; born 14 April 1988) is a South Korean footballer who plays as a striker for Jeonbuk Hyundai Motors. Kim spent his youth training either as a central defender or a defensive midfielder, but upon suggestion by his manager, he changed his position into a forward a few weeks after signing his first professional contract with Ulsan Hyundai FC. At first, he struggled to adjust in the new position but lately he has been proving his worth by being one of the top forwards in the Korean football league. His improvement as a striker the last few years is evidenced by his ever-increasing goal scoring record. 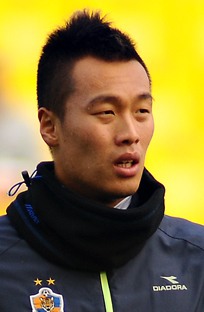 Kim was a very influential figure during Ulsan's road to the 2012 AFC Champions League winning title. Kim performed at a top level in all of the 13 matches he played in and ended the tournament with 6 goals scored. With such performance, he was nicknamed by "Attack on Titan" or "Chinook"(Boeing CH-47 Chinook). On October 2014, he and his teammates were awarded with a conscription exemption after winning the gold medal at the 2014 Asian Games. In May 2018 he was named in South Korea's preliminary 28 man squad for the 2018 FIFA World Cup in Russia. Kim is known to be a devout Christian who reads the bible before games and is nicknamed "church brother" by his teammates. He sometimes participates in evangelizing activities. ^ "2018 FIFA World Cup: List of players" (PDF). FIFA. 8 July 2018. p. 16. ^ "Kim Myung-jo · Kim Shin-wook 'Successful Era'" (in Korean). Retrieved 1 June 2018. ^ 정, 지훈 (4 June 2018). "Kim Shin-wook, "We can advance to the Round of 16"". Interfootball. Retrieved 9 June 2018. ^ "Kim Shin-wook, who replaced the gold medal in the Asian Games,". 오마이스타. 8 October 2014. Retrieved 8 June 2018. ^ "Revealed: Every World Cup 2018 squad – 23-man & preliminary lists & when will they be announced?". Goal. Retrieved 18 May 2018. ^ "월드컵 현장에 '기독교'도 뜨겁다...한국 대표팀 다수가 크리스천" ['Christianity' is hot in the World Cup scene ... Many Korean national teams are Christian]. Brazilian Protestant Social Voices (in Korean). Korea Daily. 16 June 2014. Retrieved 24 July 2017. ^ "KFA - Kim Shin-wook".